Hope everyone had a good time on the weekend and is ready to start a new week! I have been offline for a few days to take care of something. So many posts that I missed from all bento friends. I will hop from blog to blog after this. Nothing special for the weekend, only enjoying our time and relaxed a bit. And because my little brother will get married in January next year, so we had a lunch yesterday with the whole families from both sides, just to get to know each others before the Big Day. I didn't feel like to cook a lot this morning so Monday's bento was made and prepared as simple as it looks. It took only 30 minutes including the cooking time. The bears were made of egg tofu, nori, tiny jelly ball, and crab stick. Also included in this box : rice, grape tomatoes, carrots, sauteed pork sausages & green peas, and green paprika & egg. 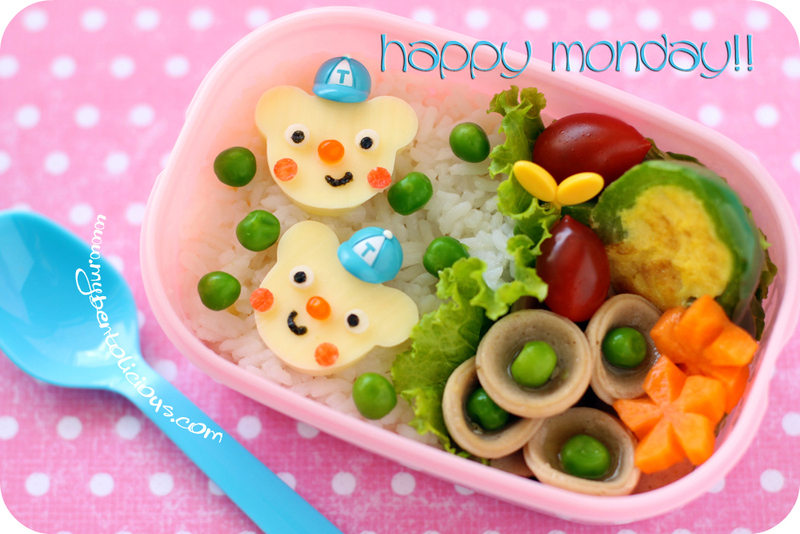 Love the Monday easy bento too. So hard to recover from weekend relaxation, heh. How fun to meet your brother's new family. I love weddings! Good week to you Lia! oh.. and happy wishes to your little brother! The bears are too cute Lia! Like two happe school boys. I must've missed something too because I didn't know you were with your little brother and he's going to get married next year! Congrats to him. It's only 5:27am and I need to run now because the Monday anxiety has hit me. Lol. Have a great day Lia! Simple but still so kawaii! it may be a quick one, but tasty-looking and adorable as usual. i love the way the sausages look like exotic flowers, and the jelly balls always make perfect noses! I wish I had your Monday morning abilities! The bento looks really cute. prince n princess mum : Thanks a lot! I love how you cut the flowers, looks like windmills :). Those jelly balls are awesome; I just want to poke at it with a pick! I dunno how you can manage to do a quick bento but still looks so darn adorable! I was trying to make flowers out of my carrots one day. let's just say I'd rather leave it in a stick. Yours are cute!! hearts for the bears! <3 they are so cute! @The Midnight Writer : Thanks a lot! just catching up on your blog Lia! love love love those green pea accents. everything is so cute as always.